Traffic congestion is typically caused by oversaturation, poor weather, vehicle crashes, work zones, poor signal timing, and special events. Over saturation occurs when more vehicles use a road than the road is designed to accommodate. The resulting congestion leads to unstable traffic flow, which instigates breakdowns and bottlenecks. The Federal Highway Administration (FHWA) has investigated how automated vehicles could improve traffic performance and reduce congestion. This research suggests the potential value of combining evolving communication and automated control systems into a cooperative automated driving technology to increase the capacity of roadways. Cooperative Automated Driving Systems use radar and other communication systems to control the throttle and brake systems of vehicles. 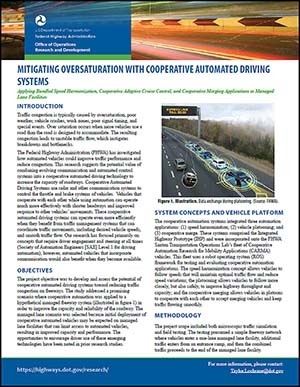 Vehicles that cooperate with each other while using automation can operate much more effectively with shorter headways and improved response to other vehicles’ movements. These cooperative automated driving systems can operate even more efficiently when they benefit from traffic management systems that can coordinate traffic movements, including desired vehicle speeds, and smooth traffic flow. Our research has focused primarily on concepts that require driver engagement and steering at all times (Society of Automation Engineers [SAE] Level 1 for driving automation), however, automated vehicles that incorporate communication would also benefit when they become available.